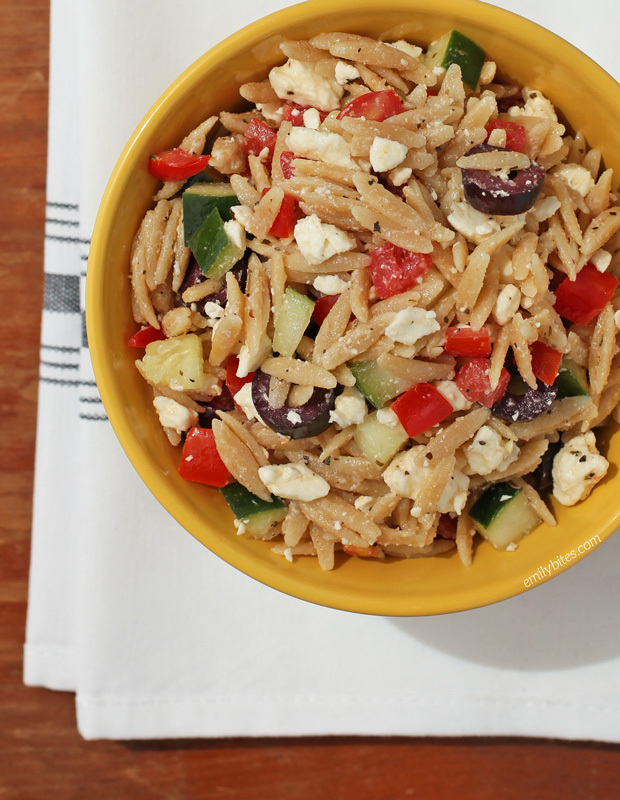 This Greek Orzo Pasta Salad is ready to be your go-to Summer dish for barbecues, potlucks, work lunches or meals at home. It’s super easy to put together and makes a great side dish to anything tasty off the grill or a fresh and portable main dish for lunch. Just 125 calories for a side dish portion or 250 for a main course lunch! You can also easily double or triple the recipe for a larger crowd. The Greek dressing is bright and herb-y, the tomatoes are juicy, the cucumbers add crunch and the Feta and olives are rich and salty. I love orzo (a pasta shaped sort of like rice) and I think it works perfectly in this dish. I can’t wait to make this again for our next backyard barbecue! Craving even more Mediterranean flavors? Check out my Greek Layer Dip, Mediterranean Pasta in Creamy Feta Sauce, Hummus and Feta Omelet, Mediterranean Chicken Wraps, Chicken Souvlaki Salad, Mediterranean Wonton Cupcakes, Cheesy Spinach Pinwheels and Feta Spread in my Greek recipes category! Cook the orzo in salted water according to package directions and drain. Allow the pasta to cool and then place it in a container in the refrigerator for at least an hour until chilled. 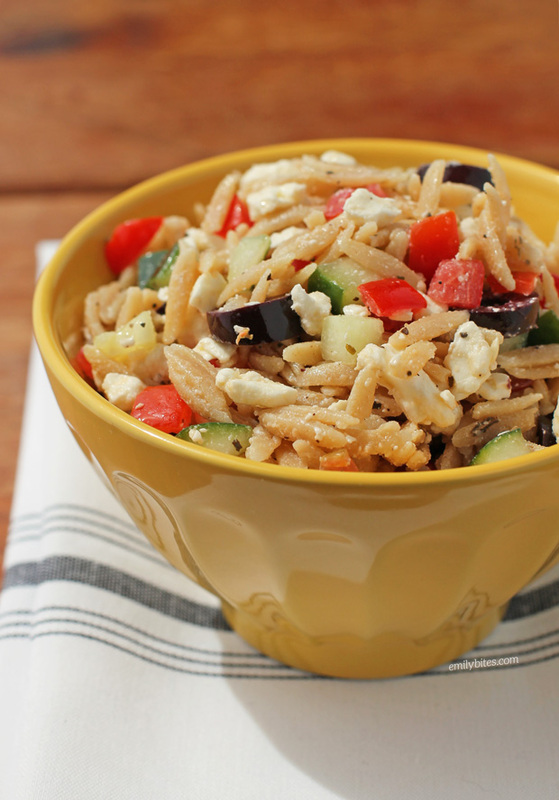 When the orzo is cool, place it in a mixing or serving bowl and add the tomatoes, cucumbers, olives and Feta and stir together until well combined. In a separate bowl, combine the olive oil, vinegar, garlic powder, onion powder, basil, oregano, salt, pepper and mustard and stir together to make a dressing until thoroughly mixed. 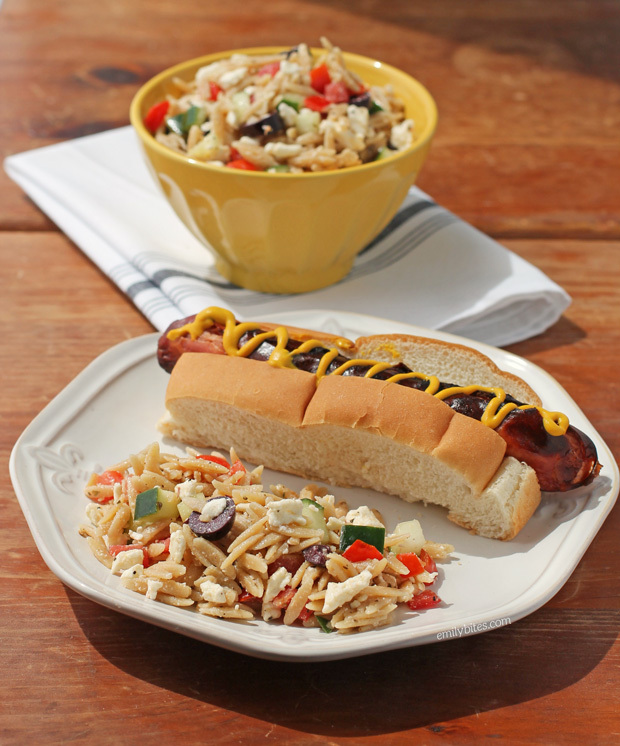 Pour the dressing over the orzo salad and toss together until pasta salad is well coated with dressing. This looks and sounds delicious, so it’s definitely going to be one of the side dishes at our next cookout. I’ll probably mix in some roughly chopped fresh parsley, and I’ll need to increase the amount of this recipe…. but I’m sure that everyone will love it! I hope you love it, let me know! Where do you find things like whole wheat orzo? My grocery store only has whole wheat in things like spaghetti and macaroni. I made this today and it was delicious! I wouldn’t change a thing about the recipe. My husband doesn’t like cold salads, so he heated his up and loved it. We’ll be making this recipe often. I’m so happy you both loved it! This is delicious!! My 5 year old son loved it too. Thanks for all of the great recipes! Would white vinegar, tarragon vinegar or balsamic work instead of white wine vinegar? Please let me know your thoughts. Thanks! I’ve never tried making the dressing with a different type of vinegar but you could certainly give it a shot – let me know what you think! Hi Emily – I started WW in January and am so glad that I came across your site – it has been a blessing! I have made several of your recipies – this is one of my favorites though (I have made it 3 or 4 times). Its perfect for bringing to work for lunch, and my boyfriend LOVES it – I usually make a double batch because I know he will chow through half of it in the first 2 days. Thanks again! I weighed out 4oz of orzo (dry) and it comes out to 1/4 cup on my WW scale. Is that right? I didn’t measure it in cups so I can’t say, but if you measured out 4 oz on your scale it should be right! This has become one of my new favorite salad recipes! So light, tasty and flavorful! I made it for a 4th of July cookout and everyone loved it! Made this salad last night and it was very tasty. I did put in a large minced clove of garlic and finely diced shallots to sub for the powders which gave the dressing an incredible flavor! I made this for my lunches this week and it is so delicious! I used fat free Feta to reduce the calories a bit. I also added cooked, chopped chicken for extra protein (I don’t think a 1-cup serving would have filled me up without some added protein). I’ll definitely be making this again! I’m so glad you loved it! I add chicken a lot when I’m planning to eat it for lunch rather than as a side dish. Thanks for letting me know it was a hit!